“The Little Country That Could”. 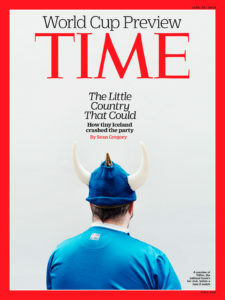 The title that sits alongside a man with a viking helmet on the cover of the new issue of Time Magazine. Excitement is definitely building up in Iceland for the Iceland- Argentina match in just over a week, and it seems the rest of the world is also taking notice to Iceland.